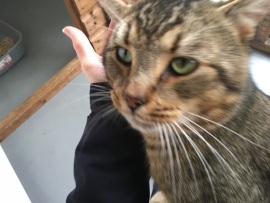 Harry is a lovely tabby cat who we think is about 2/3 years old. He is a very friendly, affectionate boy who loves being stroked, head butting you to continue!! Harry has tested positive for FIV which means he will need an indoor home or a home with an enclosed garden.